Be the first to share your favorite memory, photo or story of Mikaila. This memorial page is dedicated for family, friends and future generations to celebrate the life of their loved one. 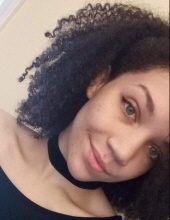 Mikaila Wells Batchler, 20, of Gaffney died Thursday, January 31, 2019. Mikaila was born on August 23, 1998 a daughter of Carlton L. Wells and Kristy Harmon Wells. Makaila was married to the late Trent Batchler of Gaffney where they resided. A graduate of Newberry High School, Mikaila was gifted and talented with a kind and quiet demeanor, yet a strong-willed personality. While living in Newberry she had been involved in a number of organizations, acting with the Newberry Community Players, participating with the Bucket Brigade, and working at the Newberry Opera House. She had also worked at the Grill on Main. Survivors include her parents, brother, Quinton W. Wells and his finance, LeAnn Marlow both of Newberry; paternal grandmother, Bessie Wells of Saluda; aunts and uncles, Brad and Michelle Harding of Florida, Linda Sue and James King of Missouri, Victoria Gentry of Seattle and her Aunt Francene..
A service will be held at 4:00 PM on Friday, February 15, 2019 at the Whitaker Funeral Home Chapel in Newberry. "Email Address" would like to share the life celebration of Mikaila Wells Batchler. Click on the "link" to go to share a favorite memory or leave a condolence message for the family.